RM50TR Mobile Container Truck 227 Litre. The RM50TR is a large mobile plastic container with a 227 litre volume and 180kg weight limit. Rotationally moulded from polyethylene (MDPE) to form a one-piece product, this mobile truck is seamless, watertight and resistant to impact. It is also easy to clean between uses which makes it an ideal storage solution for not only general industries like waste handling and laundry, but also more high care environments like food handling. 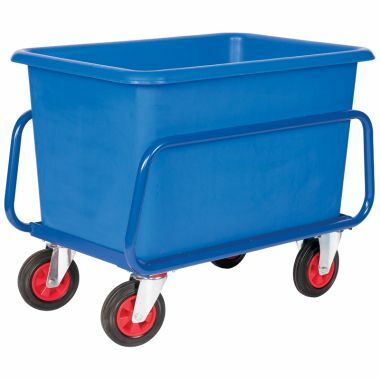 Situated on 4 x 4 inch (100mm) swivel castors, this manoeuvrable container truck can be fitted with a handle for better user control and a lid for improved storage. The RM50TR is manufactured in our UK factory and is available in a wide range of colours as including blue, red, green, yellow and white (natural) as standard. In addition, made to order colours can also be supplied and these include orange, pruple, brown and grey. We can also supply this product in black recycled plastic - to view the RM50TRREC please click here. Designed to be suitable for almost any storage application, the Supertuff plastic tapered truck range offers many things to many industries. The RM50TR is a 227 litre capacity plastic mobile bin that has a generous 180kg weight capacity. Manufactured in the UK and produced from food grade polyethylene (MDPE), these premium tapered trucks are well equipped for heavy use. Seamless and watertight, the RM50TR plastic mobile container trucks are easily cleaned and exceedingly resistant to large impacts. 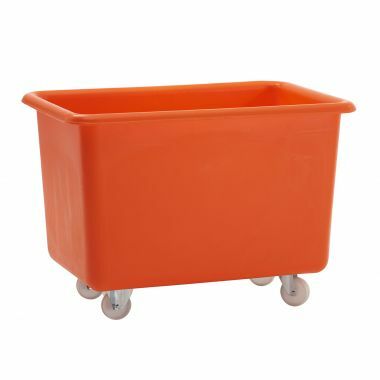 To aid with colour coding the plastic mobile bins are made in a range of colours, with even more available on request. Equipped with an intergrated plastic baseboard and situated on 4 x 4 inch (100mm) swivel castors, the RM50TR mobile tapered trucks are able to handle heavy loads and can be fitted with plastic handles if required to help with handling and manoeuvrability. Drop on food grade plastic lids can also be supplied in the same colours as the plastic mobile containers.